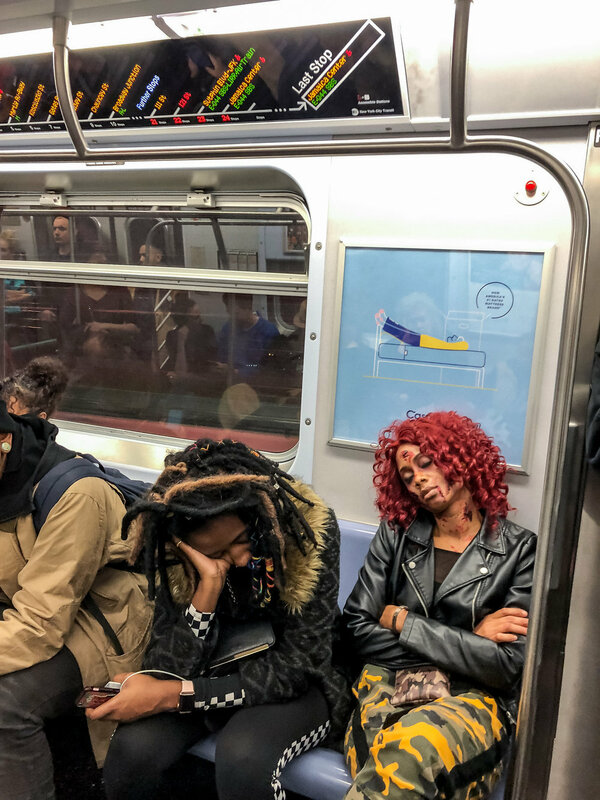 For over 4 years, I documented my regular commute on the New York City subway as a personal photo project via my iPhone camera, becoming Unlimited MetroCard, a series of candid portraits best viewed as a visual story, rather than individually. 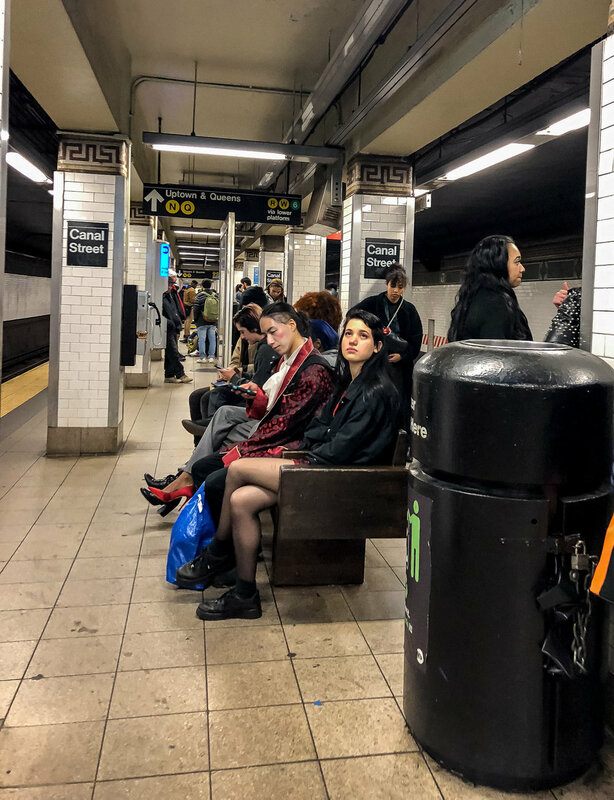 The series exists as a historical record of the people who share such close public space on a daily basis in present-day New York City, navigating one another within the continually shifting underground tunnels, during tense rush hours and brief moments of quiet. 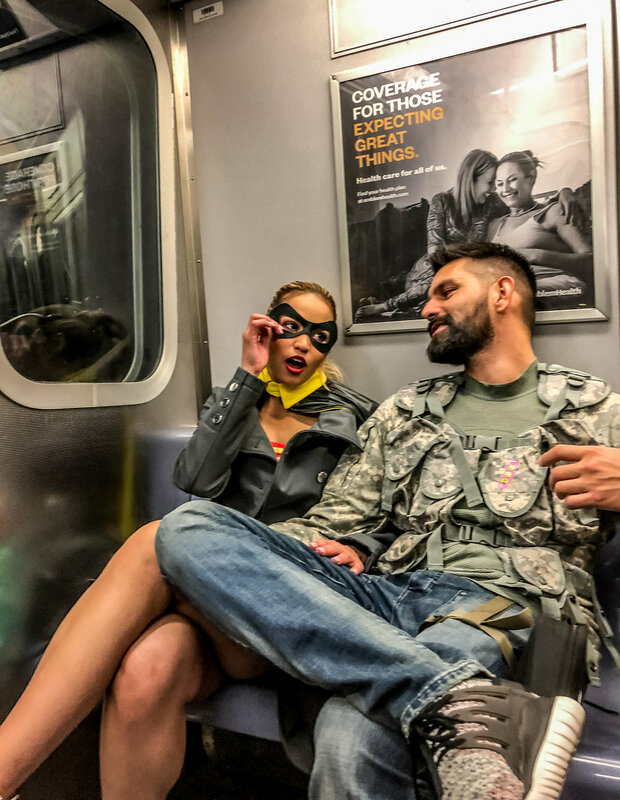 Strangers by chance traveling in the same subway car, their stories left to our imagination as they enter and exit a seat, only to be quickly replaced by another. I have since traded in documenting my commute time for reading books, away from a screen. 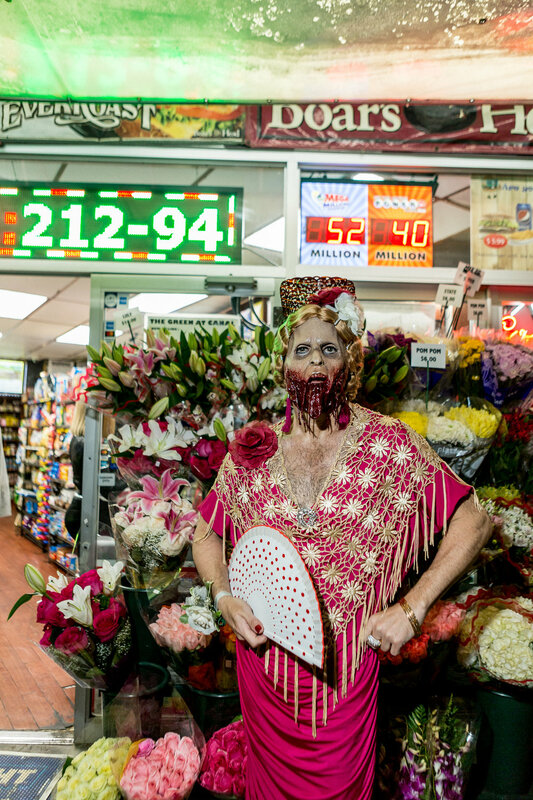 But at the generous request of Greyland Studios, I will head out to photograph the beautifully weird and magical New York City underground for the first time in two years, and on Halloween night for the first time ever. If you see me, say hello! Or check Greyland Studios for visual updates throughout the night. 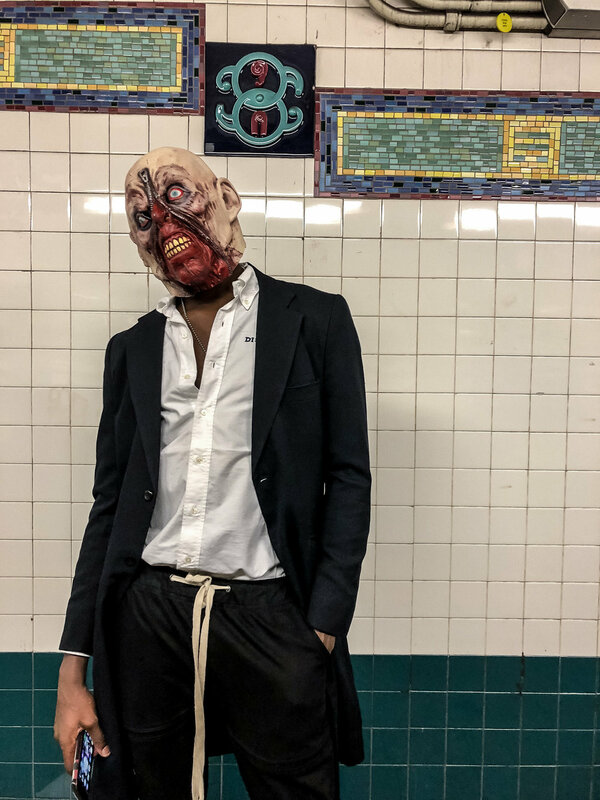 6:30 pm At the start of the annual Village Halloween Parade in Manhattan, over 60,000 people gather in costume to walk the mile-long route and I attempt to make my way off the train to Canal Street. A rush of claustrophobe consumes me and thousands of strangers in disguise as we are herded like cattle through the subway turnstiles. New York City doesn't care if it's a school night, nothing can stop a million people from joining in the dark to smash against faces hidden behind Freddy Kruger masks. I decide to walk to the outskirts and see what lurks around Chinatown. 7:30 pm I've been offered neon green Nutcrackers (look it up YOLO) and various drugs, told not to sit or stand somewhere a few times then happened upon some masked men leaning against a cop car. I take their photo then suddenly drop my flash on the concrete. Not the first time, but R.I.P. flash. My dear friend and amazing photographer Marisha Camp meets me for some much needed moral support and a slice of dollar pizza. Back to the subway. 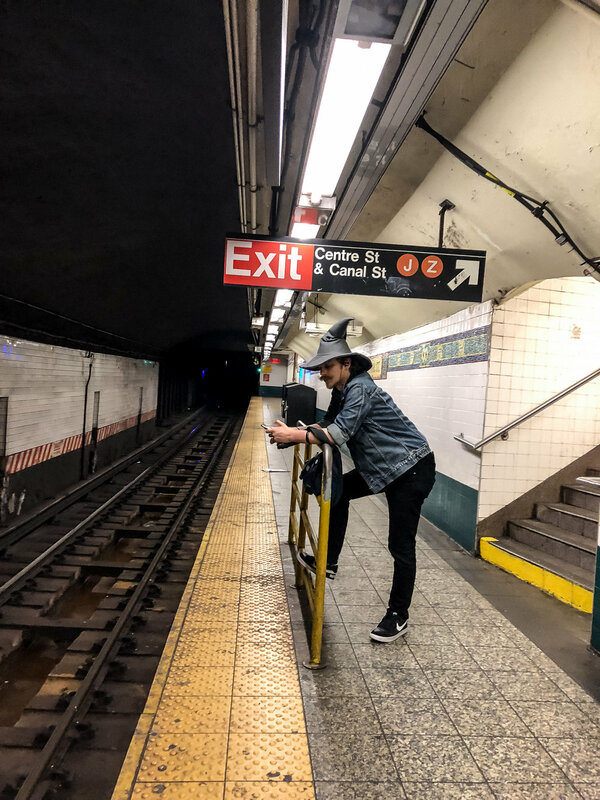 8:30 pm I spend the next few hours wandering subway platforms from Greenwich Village to Time Square. The NYC subway is essentially an underground world where nothing stops moving, lit by fluorescent bulbs instead of sunlight. 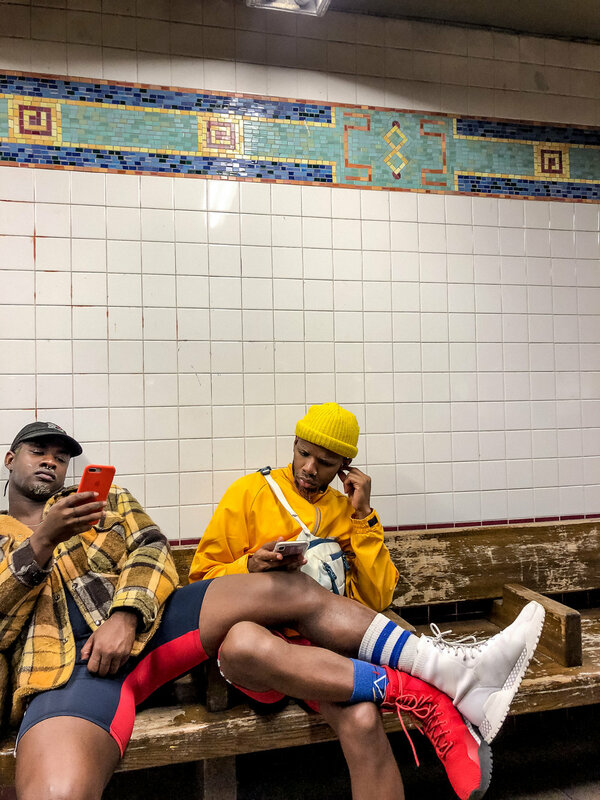 Shooting candid photos on the subway is like being a relentless creepy stalker, but without knowing what or who you are chasing after. When all else fails me, I put my headphones on and shoot from the hip. I don't really know what is happening in the frame this way, I just get in a zone where I am not really there. This lack of intention and direction works best for me, except for the 100 or so shots I lost when accidentally covered with a corner of my jacket. There are always casualties. 3:30 am It's mindblowing how thousands of costume goers could suddenly disperse and vanish, but at this point, the subway platforms are relatively empty. The city takes this rare opportunity to bleach water blast the station walls and floors, leaving a more unsettling stench than the filth it washes down to the train tracks. According to my phone app, I have walked 9 miles and climbed 24 flights of stairs this evening. I am not done yet though, because which train is still packed? The JMZ line headed to Brooklyn of course! 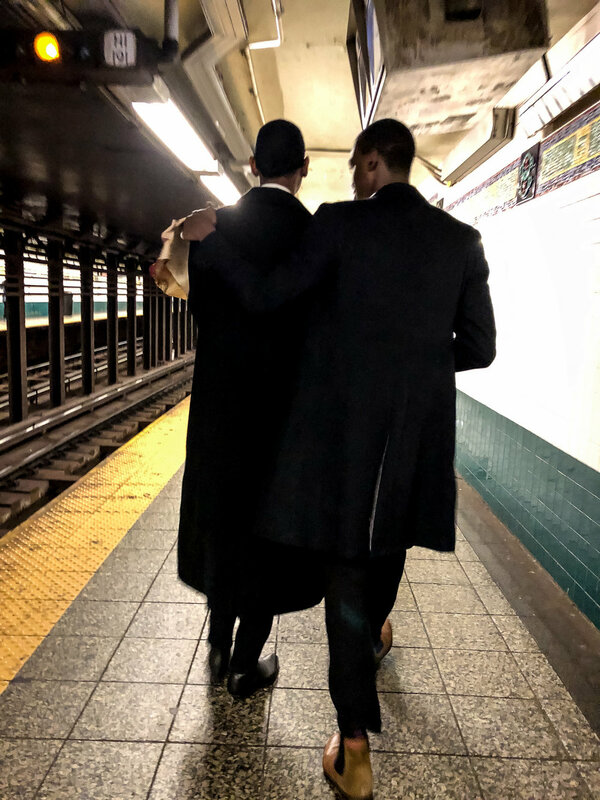 My favorite train line for subway photos any day of the year. Holiday or not, Brooklyn never takes a night off. Or morning that is. An hour or so later, my phone battery at 2% I went home to sleep.